The left cuff is one of the most common spots for a monogram on a shirt. 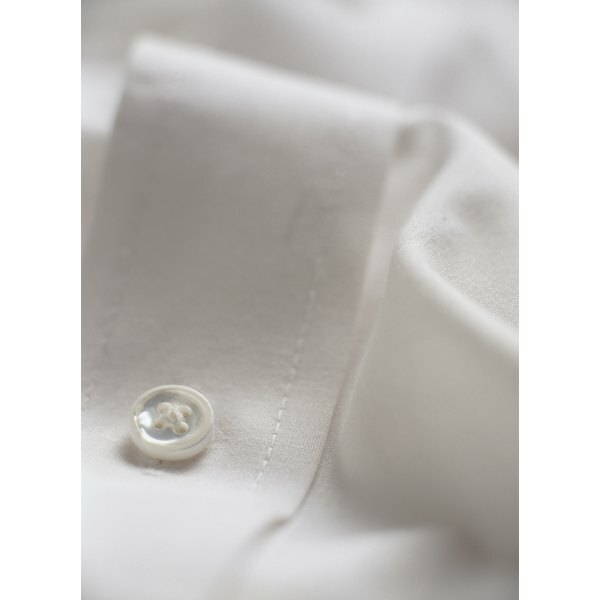 If you want to add an elegant bit of personalization to your attire, try a small, tasteful monogram on your shirt cuff. Monograms, a specialized form of embroidery, are usually placed on the left shirt cuff of a man's shirt. Monograms on shirts worn for business are typically embroidered with dark-colored thread, such as navy, black or brown. With a bit of practice, you can monogram a shirt cuff right at home. Choose a monogram pattern. Find appropriate patterns online or from pattern books in a craft store. Small initials work best for a shirt cuff, so select a pattern featuring lettering no higher than 3/8 inch. Print or photocopy the monogram pattern. Use the printout or photocopy as a template for your pattern, cutting away any excess paper around the monogram. Practice embroidering the monogram on the cuffs of an old shirt first. This helps you determine if the lettering is the appropriate size and that the loops of the "a's" and the "e's" are distinguishable when embroidered. Determine the center of the monogram. Measure the height and width of the monogram on the template and draw a pencil line halfway between each. Use a very small craft punch to punch a hole where the two lines cross. Slide a small piece of masking tape -- about the same size as the monogram -- under the template, sticky side down, lining them up until they are even. Make a pencil mark on the smooth side of the masking tape through the center hole. Place the template and the masking tape on the left shirt cuff 1/4 inch to 1/2 inch above the stitching at the edge of the cuff and 1 inch to 1 3/8 inches away from the center of the cuff toward the buttonhole. This placement ensures that the monogram will peek out from underneath the jacket sleeve. Lift the template off, leaving the masking tape on the cuff. The dot on the masking tape marks the center of the monogram. Secure the cuff in a small embroidery hoop, making sure the cuff lies flat and the fabric is taut, even if the lower end of the cuff isn't caught in the hoop. Center the dot on the masking tape in the center of the embroidery hoop. Thread an embroidery needle with 2 to 3 inches of embroidery thread, tying a knot on the longer end of the thread to secure it. Remove the masking tape and sew the monogram using a satin stitch. Begin at the left-end corner of the middle letter and push the needle up through the cuff from the wrong side. Push the needle back down from the cuff's right side through the right corner of the letter. Place the next stitch extremely close, but not on top of, the first stitch. Continue stitching progressively around the letter until it is finished, keeping the stitches horizontal and even. You may have to change the position of the cuff as you sew. Finish the letter by pushing the needle through to the wrong side of the cuff, tie off the thread and snip it close to the knot. Repeat the procedure for each letter in the monogram. If you are a novice, make a stencil of the monogram pattern and color it in on the cuff using a marker with disappearing ink. The ink will wash out when the cuff is rinsed with water.